This simple but yummy cheese sauce is extremely easy to make, and most likely, you've already got all of the five ingredients as pantry and fridge staples. Whisk together flour, milk, and a little Dijon mustard (for some kick), and cook until thickened, about 10 minutes. This is one of those sauces that you need to stir constantly (so yes, you will be stirring for about 10 minutes straight) and keep close watch on. Allow a sauce like this to come to a boil and you may have a problem on your hands. Once the mixture is thickened, stir in shredded cheddar and grated Parmesan, and you've got a great accompaniment to veggies, potatoes, pasta, or whatever else tastes good with cheese on it (and hey, what doesn't?). It's best served right away, else it will thicken and start forming a slight skin (but that's okay, just stir to smooth it out). 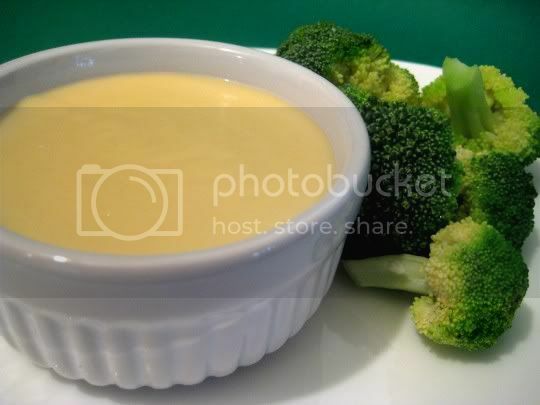 And also remember, this is a true cheese sauce made from scratch; that is, it's not going to be bright yellow, ultra smooth, and processed in any way. This is not Velveeta! Instead, you get a surprisingly rich, thick, cheesy sauce (with just a little bite from the mustard). If you want it just a bit more cheesy in flavor, I would suggest adding another quarter cup or so of cheddar (or use extra sharp as the recipe suggested; I used sharp). Even so, the sauce was delicious! Make again? Yes. It's a good, standard, quick and easy recipe. And you can never get enough cheese!